If your order weighs less than 13 ounces, save huge on shipping with USPS first class (with tracking number). This product weighs 3 oz. 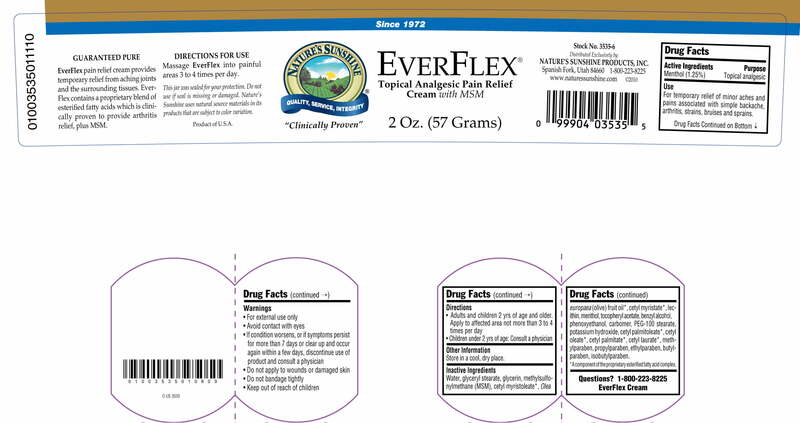 Nature’s Sunshine EverFlex Pain Cream® helps relieve pain while offering cooling relief. The formula contains menthol, a blend of cetylated fatty acid esters (cetyl myrsitoleate, myristate, palmitoleate, oleate, palmitate and laurate), olive oil and MSM. 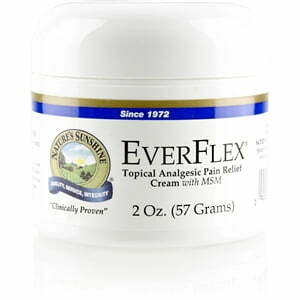 EverFlex Pain Cream offers fast-acting pain relief and is easily absorbed through the skin. 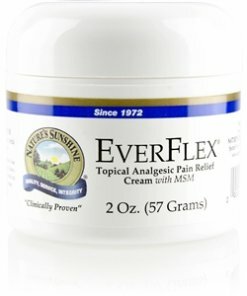 Instructions: Massage EverFlex into painful areas 3 to 4 times per day. Menthol (1.25%), Benzyl alcohol, butylparaben, carbomer, cetyl laurate, cetyl myristate, cetyl myristoleate, cetyl oleate, cetyl palmitate, cetyl palmitoleate, ethylparaben, glycerin, glyceryl stearate, isobutylparaben, lecithin, methyl-paraben, methylsulfonylmethane (MSM), Olea europaea (olive) fruit oil, PEG-100 stearate, phenoxyethanol, potassium hydroxide, propylparaben, tocopheryl acetate, water.